For an eventful excursion unlike any other, you need this Sunset Trail Super Lite travel trailer! 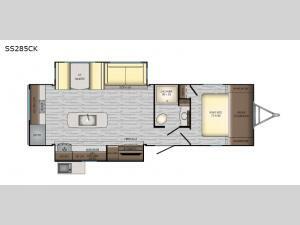 You will be amazed at the amount of helpful amenities that has been included in this unit, and because this trailer has two opposing slides in the central living area, there is extra space for a kitchen island and cozy fireplace. You will also appreciate having the opportunity to prepare meals outside at the outdoor kitchen as you watch your children ride bikes or climb trees.